Stan Ross is currently Chairman of the Board of USC’s Lusk Center for Real Estate and a Senior Fellow at the Center. The Center seeks to advance real estate knowledge, inform business practice, and address timely issues that affect the real estate industry, the urban economy, and public policy. Stan is a retired Vice Chairman of Ernst & Young and member of its Management Committee, which sets policy and strategy for the firm. 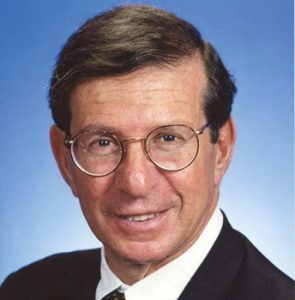 Additionally, Stan is a former Managing Partner of E&Y Kenneth Leventhal Real Estate Group, where he was responsible for its overall business planning, strategy, direction, and operations. Stan is widely recognized for his experience in strategic planning for real estate companies with expertise in mergers, acquisitions, and reorganizations, and the development of creative financial structures. He was involved in the initial organization of the Resolution Trust Corporation and was a member of the Auditing Standards Board of the AICPA, which sets the auditing rules for the accounting profession. Stan and his wife, Marilyn, have endowed the nation’s only comprehensive, minority real estate development training program aimed at educating students to revitalize inner-city neighborhoods. It is Stan’s hope to offer more programs and expand nationwide. The Ross Minority Program in Real Estate at USC teaches business professionals the fundamental skills needed to develop affordable housing, retail, mixed-use, offices, and neighborhood facilities in underserved communities. As a respected authority on real estate issues, industry leaders look to Stan for insight into the direction of the market. Despite weak commercial property values and cash flows, Stan forecasts that real estate will continue to attract capital in 2004. Stan continues his diverse activities in the real estate industry as special consultant for Ernst & Young and serves on several boards of directors, including those of The Irvine Company, Forest City Enterprises, the University of Judaism, Kennecott Land, and Empire Companies. ​Stan is a frequent lecturer at various universities, accounting symposia and real estate conferences and has written numerous articles concerning real estate and accounting matters. Additionally, he is an Honorary Trustee and Governor of the Urban Land Institute and Trustee of Baruch College, from which he graduated in 1956. Forty-three years later, Stan was awarded an honorary Doctor of Law degree from Baruch. He enjoys tennis, driving his speed boat, snow skiing, and biking. Stan and Marilyn have three daughters and 12 grandchildren.